Perched on a windswept clifftop overlooking Cardigan Bay, Cefn Castell is a modern coastal masterpiece. Its artful minimalism has captured the attention of the architectural world and garnered a slew of awards, including a nomination for the RIBA House of the Year 2015. For owners Rob and Kay Hodgson, the secret to the project’s success is simple. ‘It’s all down to the relationship with your architect,’ says Rob. 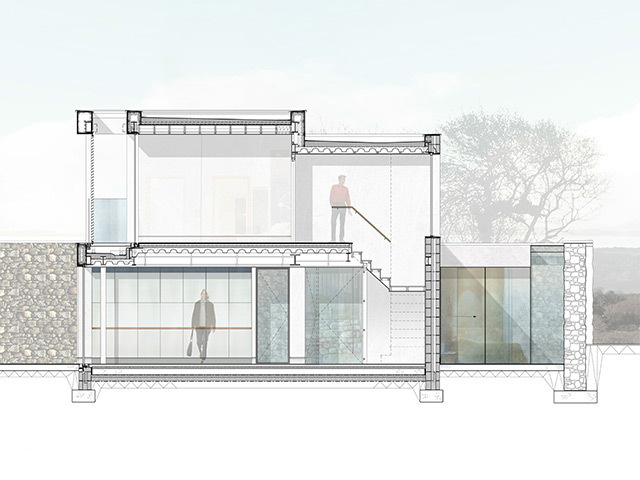 Having an open and direct relationship with the architect is crucial to realising the client’s dream home but Rob also credits an ‘overly detailed’ brief for helping John to gain a thorough insight into their modernist vision. As a result, John could establish a clear outline for what Cefn Castell should look and feel like long before the construction teams set foot on the site. Scenery was the defining consideration in the design of Cefn Castell’s three-bedroom property, with both Rob and John keen to capitalise on the site’s tremendous panoramic views over Cardigan Bay. ‘We didn’t want anyone to feel like they had a second-rate view, no matter where they were in the house,’ says Rob. Sliding screens and pivot doors were introduced to create a sense of transparency about the property, and on the first-floor master bedroom a glazed wall was installed to look out over the Irish Sea and Welsh coastline below.